With its glossy, green strap-shaped leaves and its spidery flowers that range in color from white and pink to purple and burgundy, crinum lily (Crinum spp.) can add a tropical accent to your garden. Native to Africa and Asia, this member of the Amaryllidaceae family thrives in U.S. Department of Agriculture plant hardiness zones 8b through 11, but it can also grow as far north as zone 6 as long as winter protection is provided. When grown correctly, crinum lilies are long lasting and work well as individual specimens or in a mixed flower border. Perform a soil test in the fall to determine the pH of the soil in your garden. Crinum lily prefers a soil pH range between 6.0 and 7.2. Use a commercial soil test kit or consult your local cooperative extension service regarding soil testing. Amend the soil according to the test results. This might include incorporating limestone into the top 7 inches of soil to raise the pH or using sulfur to lower it. Incorporate a 3- to 4-inch layer of organic matter such as peat or compost into the soil to promote drainage. Crinum lily requires well-drained soil, and poor drainage can result in diseases and bulb rot. At the same time, enhance nutrients by working in 3 pounds of a 5-10-5 fertilizer per 100 square feet of planting area. Unless rain is expected, water the soil immediately after fertilizing to soak the nutrients into the soil. Dig a hole with a trowel in a full or partial sunny area of the garden. Place a crinum lily bulb in the hole, planting it at least 6 inches deep with the pointed side up. Planting the bulb deeper results in a larger bulb and fewer offsets. Space multiple bulbs 2 to 3 feet apart. Water the soil immediately after planting, keeping it moist -- not wet -- throughout the growing season. Provide about 1 inch of water a week and adjust your watering after rainfall. After blooming, reduce your watering frequency, allowing the soil to dry out between watering. Spread a 2-inch layer of bark chips on the soil around the plant to keep weeds at bay and to promote soil moisture retention. In cooler climates, use a 4-inch layer of mulch for extra protection from the cold. Fertilize the soil in the planting area in spring and midsummer after the crinum lily establishes. Broadcast a 5-10-5 fertilizer over the soil at a rate of 3 pounds per 100 square feet. Water the soil after fertilizing to soak the nutrients into the soil. Avoid moving crinum lily, because the plant dislikes having its roots disturbed. 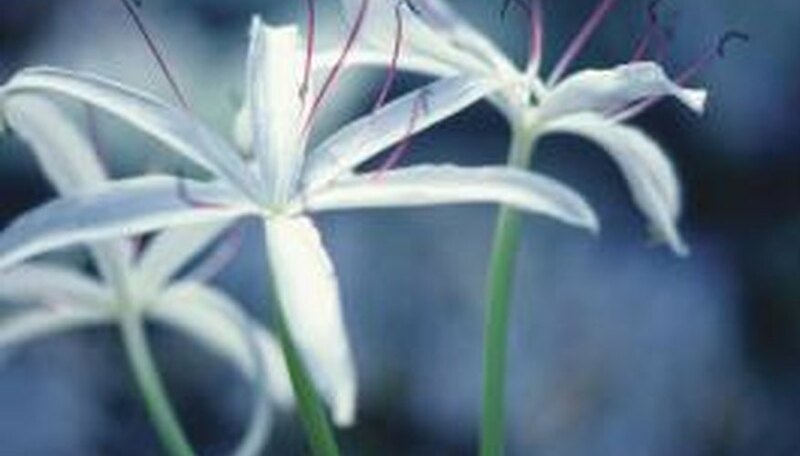 In cold climates, place crinum lilies in a protected area near the house. Grow them in pots that are 2 inches larger in diameter than the bulbs so you can move them indoors in the fall before the first frost. Plant the bulbs in the pots with the tips of their necks just above the surface. Crinum lily is poisonous. Ingestion of the plant can cause diarrhea or vomiting, and its sap can trigger skin irritation or a rash. If affected, consult your doctor or a poison control center.